A makeshift tarp shelter is minimal, portable and generally effective for providing cover from the elements and keeping you dry. In order to take full advantage of a tarp’s ability, be sure to include some paracord and duct tape. The paracord will allow you to tie off the tarp to a tree or other structure to create a roof over your head and the duct tape will come in handy for repairs should your tarp become damaged. This method will at least provide you with a dry place to hunker down in and can be pulled out of or packed back into your BOB quickly. 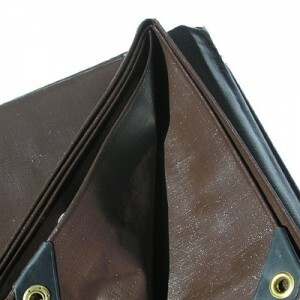 A tarp is also light and won’t take up valuable room inside your BOB. When budget and space allow- this is the ideal shelter situation. I personally chose to include a lightweight, one person tent into my BOB preps. Although my choice was a single person tent, my entire family (myself, wife and 1 year old) could make due during an emergency. There are plenty of ultralight tents on the market that stuff down into a packable BOB friendly size and won’t add a large amount of weight on your shoulders. You’ve got the option to stuff it inside your bag or secure it to the outside, and along with the tarp idea, include paracord and duct tape for tie downs and repairs. 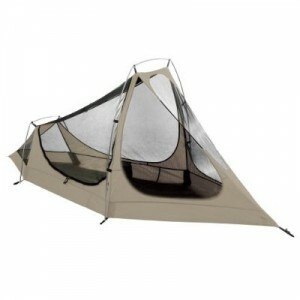 On a budget or wanting to keep things light and minimal go for my personal BOB tent – Eureka Spitfire $129. But also check out the Eureka Solitaire $98, which has more room but still rather light and packable, or the Alps Mystique $153, a two person ultra-portable tent. You may find yourself in a situation that requires you to be creative and use what you have at your disposal or what nature can provide. Field and Stream has a good run-down of 7 makeshift shelters that can save your life in an emergency. 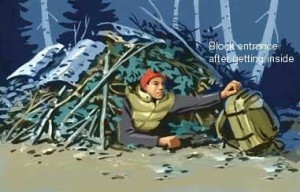 In my bug out gear you’ll find both a tarp and a tent. I recommend having more than one option to cover your shelter needs. Protecting yourself from the elements is important in an emergency situation so don’t forget to include a plan for shelter. This entry was posted in Advice, Checklists by eboz. Bookmark the permalink.